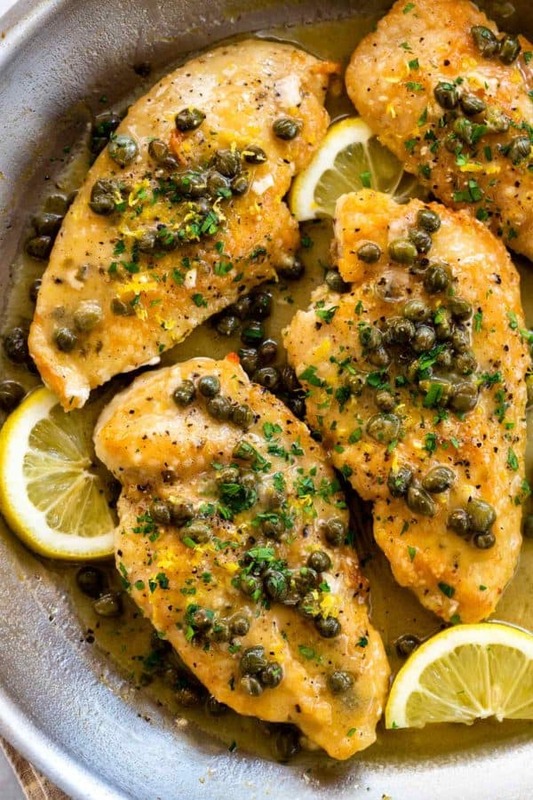 Chicken piccata with lemon caper sauce is a fast and easy weeknight meal. Lightly breading and pan-frying the chicken breasts creates a beautiful golden brown crust. The cutlets are simmered in a tangy sauce that clings to each bite. Chicken piccata is an Italian dish to crave. The name might sound fancy, but it’s actually quite simple to prepare. This recipe uses poultry with a simple dredging and skillet cooking technique, but veal and even fish can be substituted. The contrast of lightly breaded and pan-fried cutlets cradled in a lemon caper reduction sauce is a wonderful combination. You’ll want to serve this with pasta or rice to soak up all of the luscious flavors. The dish uses everyday pantry staples and fresh ingredients to create a rustic and satisfying meal. Cut chicken breasts into 4 even-sized pieces. Season with salt and pepper, then dredge in flour. Add chicken and cook until lightly browned on each side. Remove the chicken and make the sauce. Reduce capers, lemon juice, zest, chicken stock, and thyme. Add chicken back to the pan to warm. Whisk in butter to create a lightly thickened sauce. How do you flatten the chicken for even cooking? My mother-in-law Joan, who is an excellent home cook, taught me many years ago a simple trick to flattening out a chicken. She uses the bottom of a wine bottle! No fancy equipment necessary, and the result is similar to a rolling pin or mallet. You can also slice through the center of the chicken to make two pieces. Grocery stores also sell thinly sliced chicken cutlets for your convenience. Flattening the meat ensures even cooking. What coating do you use for chicken piccata? A sprinkling of salt and pepper, dusting in flour, and a quick dip in hot olive oil and the cutlets are ready for some lemon caper sauce! Traditionally chicken piccata has a light coating of flour on the surface so a subtle golden crust forms. If you want a thicker and more crunchy exterior, use the standard breading procedure. How do you make lemon caper sauce? The sauce is a reduction of lemon juice, chicken broth, and capers. They simmer until concentrated and until the browned flavorful bits from frying the chicken dissolve. The trick to making a silky and lightly thickened sauce is to whisk in cold butter at the very end over low heat to create an emulsion. What are capers and why is it added to the sauce? Capers are pickled flower buds from a shrub-like bush called Capparis spinosa. They are sun-dried and brined or salted, and when added to dishes provide an intense, pungent, salty and tangy flavor. It’s an acquired taste, but when you unlock it’s potential, watch out! They make this dish unique and exciting. Each tiny sphere packs massive flavor so don’t leave it out. 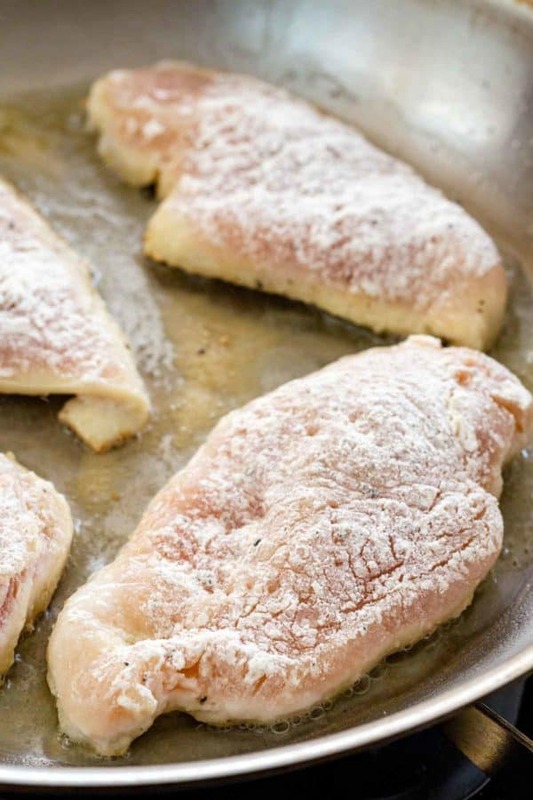 How do you prevent chicken from drying out when pan-frying? The key to evenly cooking chicken especially when pan-frying is to pound out the pieces or cut them in half so they’re all the same thickness. About a half inch is good, you don’t want to go paper thin. If you have an instant-read digital thermometer, you can quickly check the doneness temperature. Stop cooking when the internal temperature reaches 160°F (71ºC). Chicken piccata with lemon caper sauce is an easy weeknight meal. Lightly breading and pan-frying chicken breasts creates a beautiful golden brown crust. Season both sides of chicken pieces with salt and pepper. Combine 1/2 teaspoon salt, 1/4 teaspoon pepper, and flour in a shallow bowl. Dredge chicken breasts in flour shaking off excess, transfer to a plate. In a large 12-inch skillet over medium-high heat, once hot add olive oil. When oil is hot carefully add chicken to the pan. Cook for 3 minutes on each side until lightly browned. Remove and transfer to a plate. Add capers, lemon juice, lemon zest, chicken stock, and thyme to the pan. Bring liquid to a simmer and scrape down the brown bits from the pan and whisk until dissolved into the liquid. Reduce the sauce for 2 minutes. Return chicken to the pan and simmer over medium-low heat for 5 minutes, flipping the chicken halfway through. Transfer chicken to a platter. Remove and discard the thyme. Over low heat, vigorously whisk in 2 tablespoons of butter into the sauce. Taste and season with more salt and pepper as desired. MAKE IT GLUTEN-FREE: Use gluten-free flour instead of all-purpose flour. Happy Birthday, Jessica! Hope you have a great one. I love chicken piccata. I used to smash my chicken with a frying pan before I invested in a meat tenderizer. I would also butterfly the chicken as well to get the same thickness. The secret to any juicy chicken for me is to always brine the meat for at least an hour. It works every time. Thank you so much Janice! It was a great indulgent day celebrating with my guys 🙂 I love the brining idea, I have used that before for thick pork chops and fried chicken, definitely a great suggestion! I made this for the fam last night. It turned out great! U used medium heat so my chicken took a little longer. The key is just to wait for it to turn a little golden brown. Excellent flavor. I added angel hair pasta with clam sauce to the dinner menu. It complemented the chicken very well. This pairs well with a light bodied chardonnay. Thanks for a great recipe Jessica! Thanks, John. Rickie forwarded the recipe to me after you shared it with the guys. Chic Piccata is always my favorite dish ! Another slam dunk from Jessica! My 7 year old gobbled up this dish, which I served with green beans and rice. The sauce was super delish and the chicken was very tender and juicy. Not to mention, easy cleanup!! I made plenty for easy reheating on Monday which is my busiest and least favorite night of the week to cook. Thanks for all the great recipes – my family appreciates it too! Thank you for your wonderful comment Cristina! I’m so happy to hear that the whole family enjoyed the recipe 🙂 Glad the clean up was a breeze too. Looking forward to sharing more recipes with you! Just made this piccata with gluten free flour and it was FABULOUS! So lemony! Cucumber-tomato dill salad with pasta and a bit of Parmesan. Yu-um!!! Thanks for sharing the gf flour idea ! I have some and wondered if it would work. Tried this recipe last night – Definitely a ‘keeper’! Keep these amazing recipes coming! What would you suggest I use in place of butter to thicken sauce at end? I am trying to be dairy free. Thank you. Hi Carol- You can use some coconut oil, or coconut cream to thicken the sauce.